M&S Parking: New GPS standards aim to eliminate bridge hits. New GPS standards aim to eliminate bridge hits. According to the New York Times, Senator Charles E. Schumer and federal officials have announced new federal standards for GPS use in commercial trucks. The new standards are being introduced in an effort to reduce the number of trucks hitting or getting stuck under bridges as a result of being rerouted by their consumer level GPS systems. 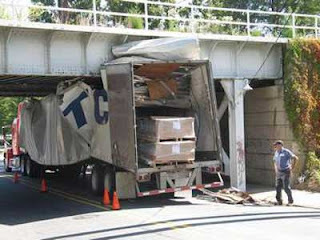 Mr. Schumer says that, "eighty percent of all trucks that get stuck under bridges are the result of using the wrong GPS." The federal Motor Carrier Safety Administration will issue official recommendations for commercial GPS systems, which take into account the vehicles weight, height, and load when planning routes and avoid roads where that vehicle is prohibited. While the professional units are more expensive, they are expected to save money long term by avoiding costly damage to vehicles. Drivers applying for or renewing their commercial driver's license will be required to take GPS training. I think that this should be a requirement everywhere mainly because you don't want these type of things to happen too often. That's why we are implementing a commercial GPS system that will be set on all of our commercial vehicles to ensue we know where the vehicles will be going and advise them on what routes to take. Yeah i agree with you.Its need to be work out on these type of bridges,for the safety and for the easiness of the people.Nice to know about this issue.Very informative blog.If you want to track your vehicle so have a look on bmw vin decoder full.